There’s been an awful lot of soup in my life for the past few weeks. Every time I put another pot on the stove, the little voice in my head replays a line from the movie “Juno”. Um, hopefully I’m just being paranoid, but I think I could have been the inspiration behind that whole scene. The weather has been cold as all get out though and I do what I’ve got to do to stay warm and semi-sane through the winter. I make soup. A lot. And I probably smell like soup. And my whole house, too. Oh well, c’est la vie. 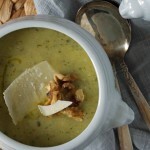 My latest batch of soup is a simple cannellini bean soup with 2 whole heads of roasted garlic pureed into it, garnished with Parmesan frico crisps. It’s hearty and satisfying and pretty healthy at the same time. The garlic isn’t the least bit abrasive, instead it provides a round, almost sweet undertone to the white beans. The crisp rounds of Parmesan add nutty, cheesy crunch. All in all, it provides further evidence that it’s okay to smell like soup, as long as eating it makes you feel good. At least that’s what I’m going with. First things first, soak your beans overnight. I actually got up out of bed around 2 am to get beans soaking because I just knew the next day was going to be a soup day. Also, I’m a little crazy. Drain the soaked beans and put them in a pan with fresh water and some aromatics. I threw in a halved onion, a couple of bay leaves, and a sprig of rosemary. Put them on to cook while you roast garlic and make the frico. Cut the tops off of 2 cloves of garlic to expose the cloves and peel off the outer layers of skin. Pour a bit of olive oil over them and wrap each one in a little bundle of foil. Now roast the garlic until the cloves are very tender and pop right out when you give them a squeeze. While the garlic is roasting, make the frico. A frico is a crisp little cracker made from melted Parmesan cheese. The Parmesan takes on a different flavor as it melts, becoming nutty and little tangy. They are good on their own just to munch, but I love using them like I am here to add another dimension to a simple soup. Grate a pile of Parmesan using the big holes on a box grater. Toss the cheese with a spoonful of flour and a few twists of pepper, then spread into circles on a lined baking sheet. 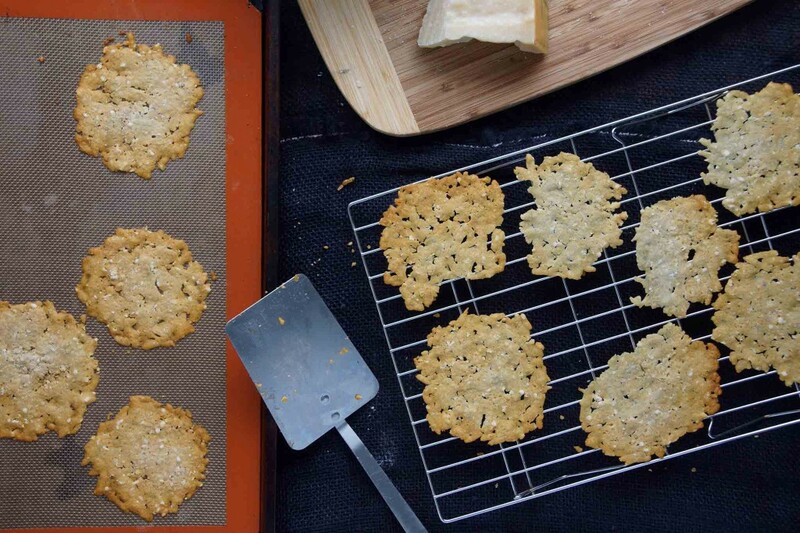 Bake for a few minutes until the cheese bubbles and melts, turns gold, and fuses together to make a cracker. Pull them out of the oven, let them cool and set up for a moment, then transfer them to a wire rack to finish cooling. Side note–make sure your dog is nowhere near. Why do I feel the need to mention this tidbit? I’m sure you can guess. Okay, let’s get back to the soup now. 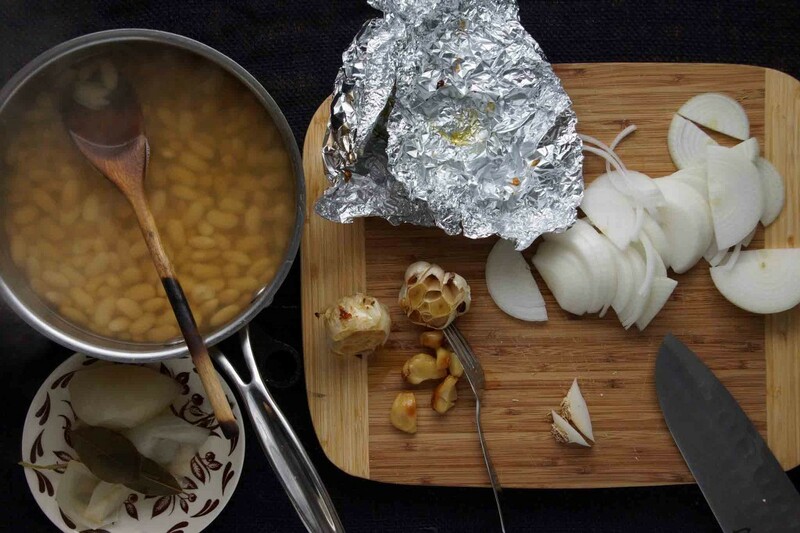 As soon as the beans are tender and the garlic has been roasted, you’re ready to roll. Pull the aromatics out of the beans, squeeze the heads of garlic to release the cloves, and slice an onion. Sweat the onion down in some olive oil, then add all of that roasted garlic goodness. Pour in the beans and their cooking water and simmer until the flavors unite. 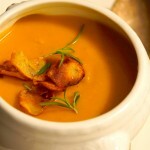 Puree the soup until smooth with an immersion blender or food processor, thinning with a bit of stock, as needed. Adjust the seasoning, reheat, and serve it up. Settle in with a big bowl topped with a frico or 2. Crack the frico with your spoon and slurp up your latest batch of soup. Who cares if you smell like soup? That mocking voice in your head is probably just jealous. 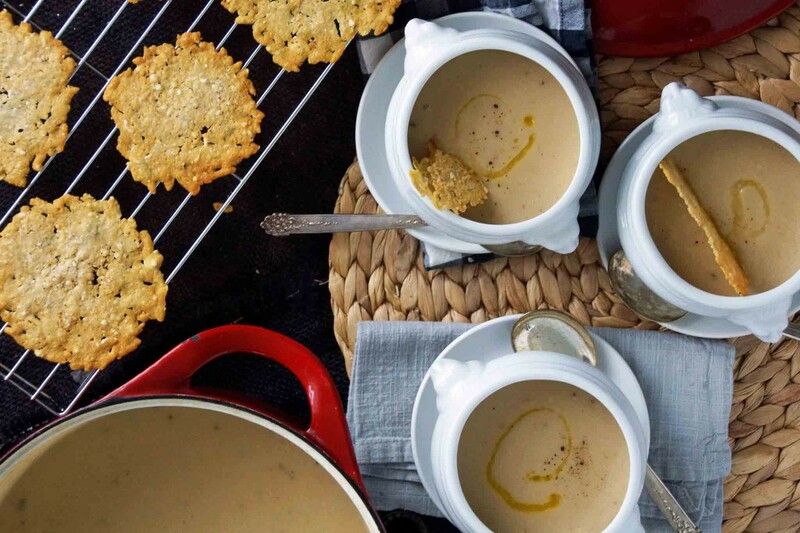 It’s winter and soup is where it’s at. 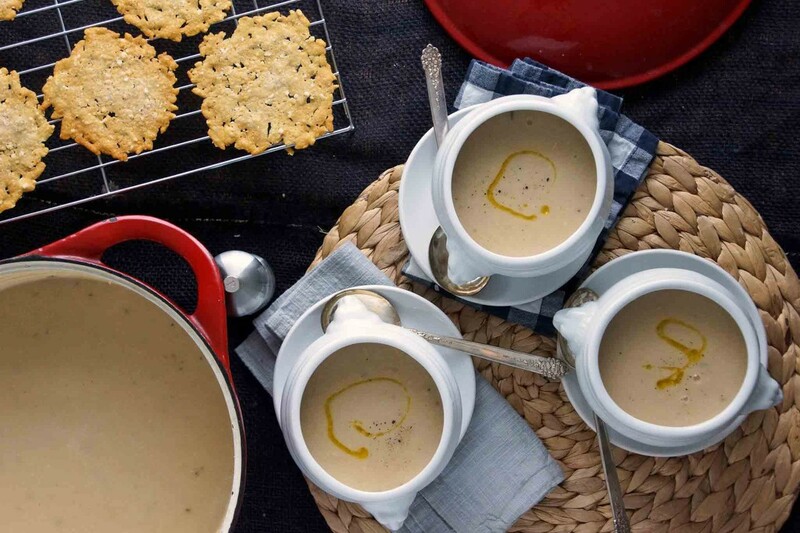 The Parmesan frico add a pleasant crunch and nutty, cheesy flavor to this simple bean soup. As with many soups, the flavor will continue to develop and it's actually better the day after you make it. 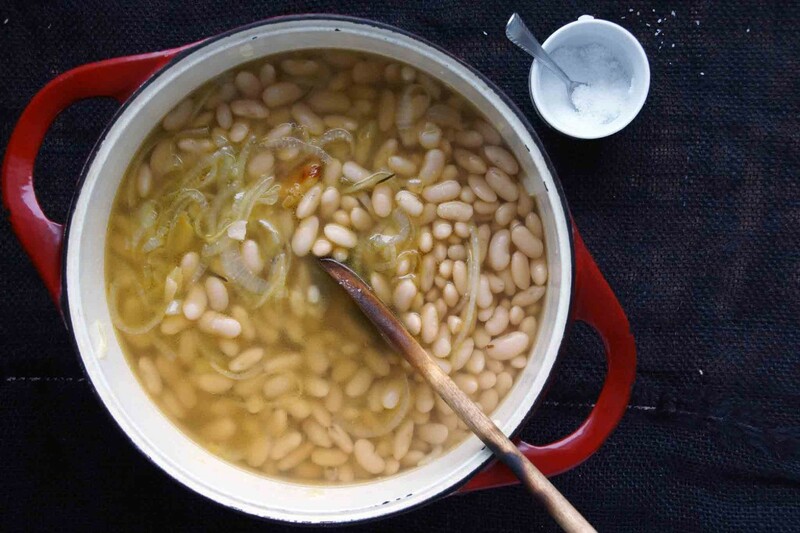 Drain the soaked cannellini beans, rinse, and place in a large saucepan. Add the bay leaves, rosemary, halved onion, and cold water to cover by an inch. 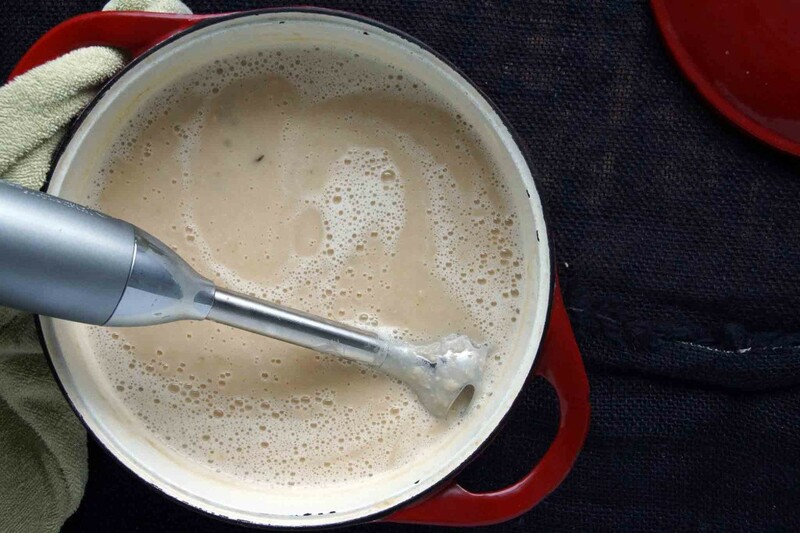 Bring to a boil, skim off the foam, and then reduce the heat to maintain a simmer. Cover the pan and cook until the beans are tender, about 1½ hours. Meanwhile, preheat the oven to 375° and roast the garlic and make the frico. Cut the top off of each head of garlic and remove the outer layers of papery skin. 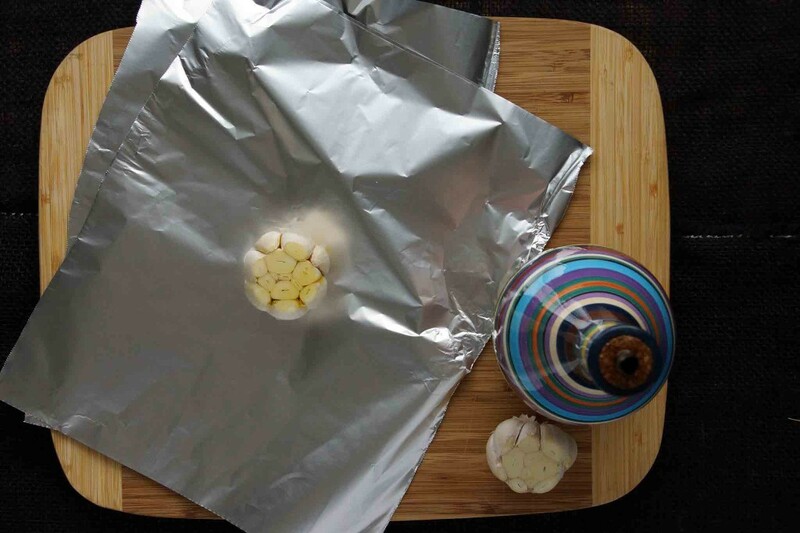 Place each head of garlic on a sheet of foil, pour a tsp. or 2 of olive oil over the exposed cloves. Pull the foil up over the garlic to make a little bundle. Roast the garlic until the cloves are very soft and beginning to pop out of the skin, about 45 minutes. Allow to cool until you are able to handle them and then squeeze out the individual cloves of garlic. 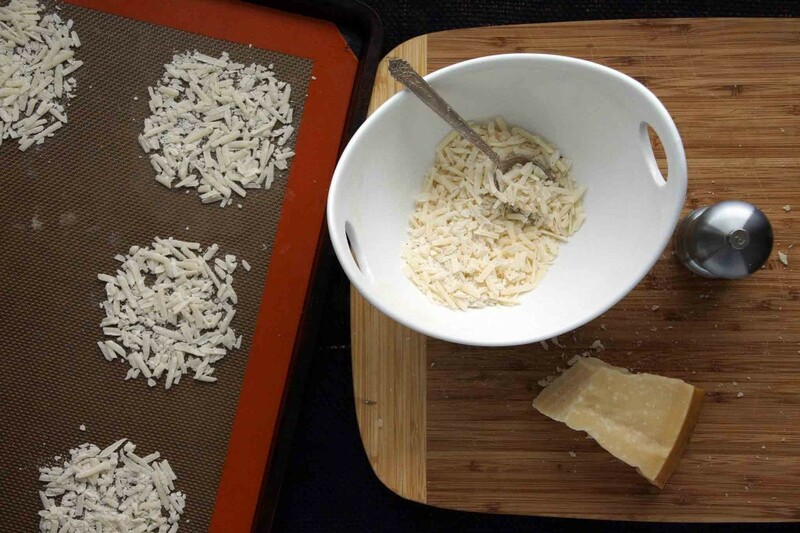 While the garlic is roasting, make the Parmesan frico. Line a baking sheet with parchment paper or a silpat. Combine the coarsely grated Parmesan, flour, and a few twists of black pepper in a small bowl. Using about 1 Tbsp. of the Parmesan mixture at a time, create a 3” circle on the lined baking sheet. Don’t worry if there are a few holes in the circles—they’ll fill in as the cheese melts. Bake until the cheese is golden, about 6 minutes. Cool for a minute on the pan, then transfer to a wire rack to cool completely. Be careful, as they are quite delicate. 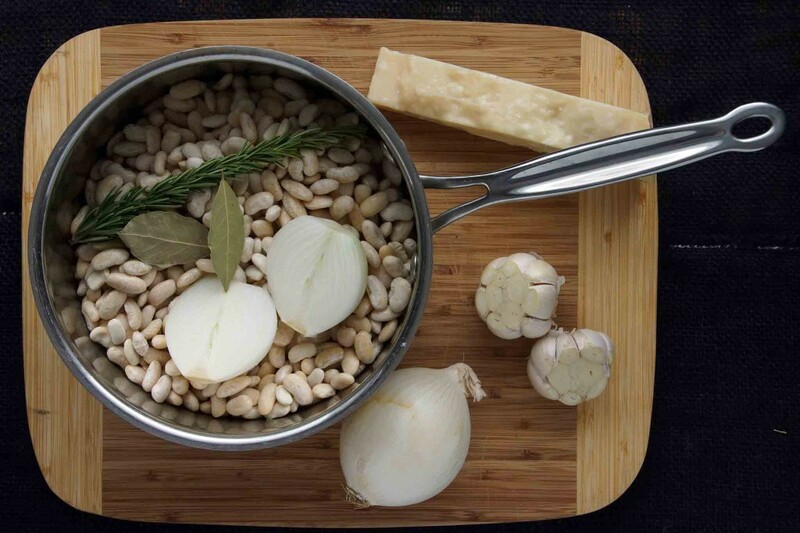 When the beans are soft, remove the halved onion, bay leaves, and rosemary branch. Heat about 3 Tbsp. olive oil in a soup pot or Dutch oven. Add the sliced onion, season with a bit of salt, and sauté until soft and translucent, about 8 minutes. Add the roasted garlic and cook for another minute or 2. Now add the beans along with their cooking liquid and a scant tsp. kosher salt. Bring to a boil, then reduce to a simmer. Simmer for about 15 minutes or until the flavors have melded. Allow to cool slightly, then puree using an immersion blender, food processor, or conventional blender. Return to the pot and reheat, thinning as needed with chicken or vegetable stock. Taste. Season with additional salt, if necessary, about 1 Tbsp. of lemon juice, and plenty of freshly ground black pepper. 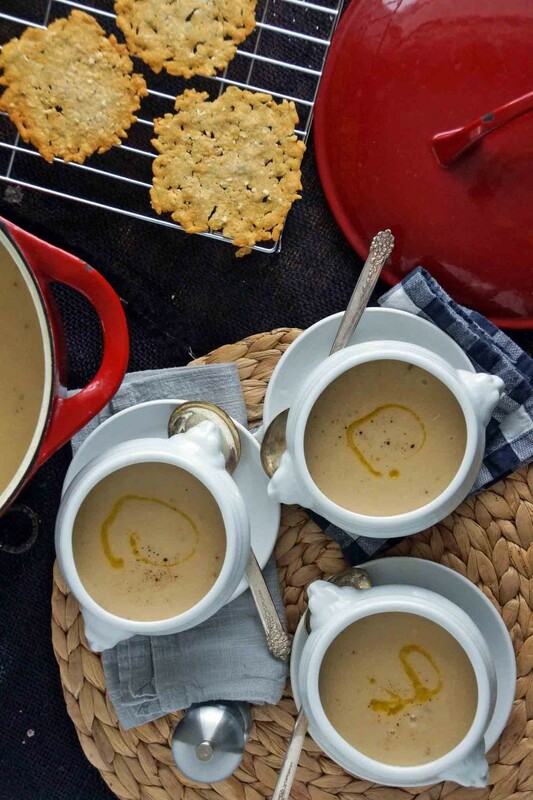 Divide the soup between bowls and top each portion with a Parmesan frico or 2. The frico will keep in an airtight container at room temperature for a couple of days. You lucky teacher! Where were all of these snow-days when I was a kid? How big of a deal is it if you use canned beans? Not a big deal, especially since it gets pureed in the end. You’ll need more stock since you won’t have the flavorful cooking liquid from the beans and I’d add the rosemary and bay leaves while you simmer the soup. Hope you like it. 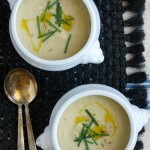 It’s a simple but very satisfying soup!